absolutely stunning! keep 'em coming! OK now you're speaking my language Biffy Beans! I loved the pinks oranges and yellows as well, but blue/green is my favorite color palette. You know, it's strange really. Purple has always been my favorite color, but when I started getting into fountain pens and ink it started to fall in love with blue and green. Go figure. Ooh! 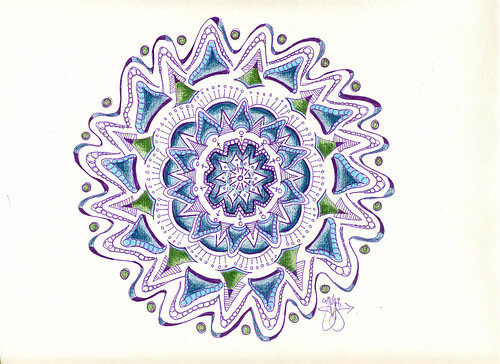 That top mandala is my favorite Biffybeans mandala of all time. It displayed on my monitor like a firework, except the beauty stayed instead of falling to the ground. Brilliant colors. Your blue and green mandalas have a peacefulness to them that is hard to put in words. They just soothe the soul.